Nagoya, Japan - The history of archaeology is replete with legendary finds, from the Temple of Artemis to Tutankhamun's tomb. Often, what seems like a chance discovery is actually the payoff for years of careful work. 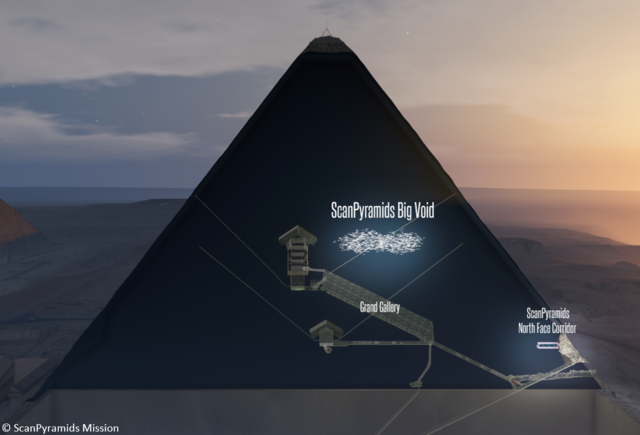 Now, the Great Pyramid in Egypt has revealed an unexpected secret to a research team led by Nagoya University. But these researchers used tools that earlier archaeologists never dreamed of. 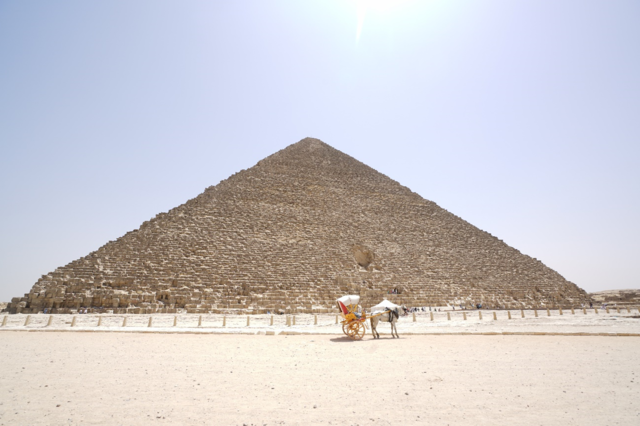 The Great Pyramid, or Pyramid of Cheops, was built on the Giza Plateau around 2500 BC. It is instantly recognizable for its sandy appearance and monumental size - in fact, it was the tallest building on Earth for 4,000 years. Inside, the pyramid contains several interconnected rooms, known as the King's Chamber, Queen's Chamber, and subterranean chamber. However, Egyptologists have long suspected there may be other, as-yet-undiscovered rooms or tunnels. The pyramid is a World Heritage Site, so simply digging for clues is not an option. To get around this, the researchers devised a way of scanning the building from within. To solve the problem of scanning through stone, they used a method called "cosmic-ray muon radiography." This involves detecting a type of radiation - muons - produced by cosmic rays in the atmosphere. "Cosmic-ray muon radiography is like X-ray imaging for entire buildings," explains Kunihiro Morishima, lead author of a Letter in Nature announcing the finding. "Muons travel at near the speed of light, and pass straight through most materials. However, when they pass through solid rock, they lose their energy and many are brought to a stop, and absorbed. By counting how many muons pass through a structure, we can calculate whether they have traveled through air or stone. This lets us picture the interior of buildings in a non-invasive way." 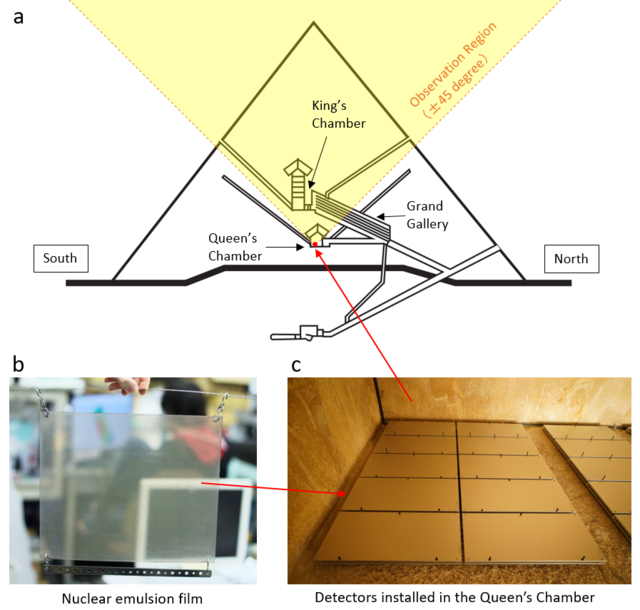 In a project dubbed ScanPyramids, the team placed special photographic film-type detectors called nuclear emulsion films in the Queen's Chamber, near the base of the pyramid, and counted the muons arriving from above. An unexpected excess in the muon count was found passing through one particular part of the pyramid - the telltale sign of a "void," or empty space, estimated at 30 meters long and from approximately 60 to 70 meters above ground level. No evidence previously existed for this void, which lies above the Grand Gallery. To confirm their results, they repeated the measurements using muon detectors of a different design. The first of these detectors, operated by KEK, Japan, was placed inside the Queen's Chamber, to get a view from a similar position. The second detector, operated by the University of Paris-Saclay, France, was placed outside the pyramid's entrance, to get a view from another angle. 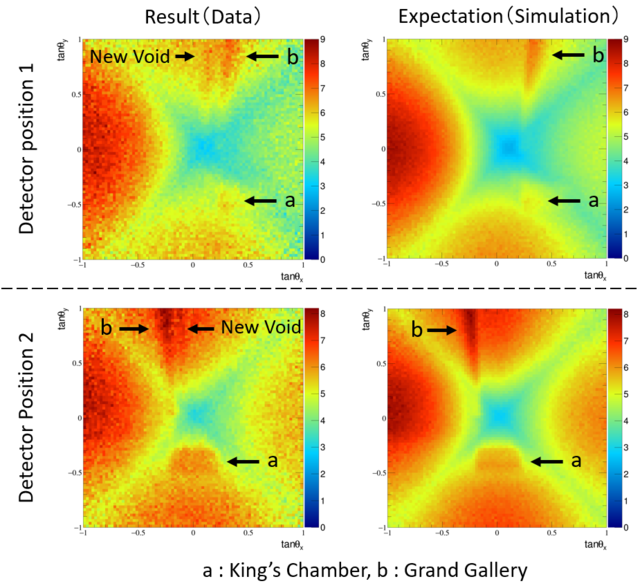 These findings backed their original hunch - the Great Pyramid contains a large empty space, similar in size to the Grand Gallery, which has never been entered in modern times and whose purpose is unknown. "Many questions remain about how the pyramids were built," Morishima says. "Hopefully, further research will shed light on whether this newly discovered void was involved somehow in the pyramid's construction. In fact, the cosmic-ray muon technique could transform our understanding of heritage structures across the world." 1 F-lab. (Fundamental Particle Physics Laboratory), Graduate School of Science, Nagoya University, Japan. 2 High Energy Accelerator Research Organization, KEK, Japan. 3 IRFU, CEA, Université Paris Saclay, France. 4 Cairo University, Egypt. 5 HIP Institute, France. 6 Dassault Systèmes, France. 7 Emissive, France. 8 NEP (NHK Enterprises), Japan. 9 Suave images, Japan. 10 Inria Nancy, France. and more... *You can see more media coverages on Nature's website. Funding: This experiment is part of the ScanPyramids project, which is supported by NHK, La Fondation Dassault Systèmes, Suez, IceWatch, le Groupe Dassault, Batscop, Itekube, Parrot, ILP, Kurtzdev, Gen-G, Schneider Electric. The measurement with nuclear emulsions was supported by the JSTSENTAN Program from Japan Science and Technology Agency, JST and JSPS KAKENHI Grant Numbers JP15H04241. The CEA telescopes were partly funded by the Région Ile-de-France and the P2IO LabEx (ANR-10-LABX-0038) in the framework "Investissements d'Avenir" (ANR-11-IDEX-0003-01) managed by the Agence Nationale de la Recherche (ANR, France).